Roger Dennis developed his interest in restoring cane and rush furniture during his career in the Ministry of Defence when he and his wife Noelle purchased two cane chairs from a junk shop in Salisbury in the 1980's. Both chairs had been painted orange and the cane seats were in a very poor state. Many hours of painstaking work and a number of hours studying various reference books later, and both chairs had been stripped, polished and re-caned. These chairs are still in use today. When Roger retired from full time employment in 2014 he was not about to sit back and vegetate, but advertised locally for cane work initially. His first customer was Mike Durkee of Castle House Restoration in Wincanton, and as sometimes happens, things developed from this small beginning and rush work was added to the repertoire.Over the last three years or so, Roger has re-caned or re-rushed a wide range of chairs and other furniture. 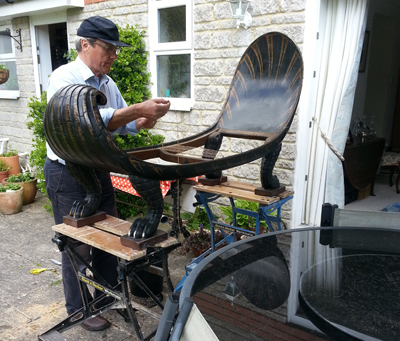 Roger, working on a Regency Crocodile Chaise in the summer sunshine of 2016.